Nandina domestica shrub with red berries. Drought-tolerant shrubs come in mighty handy for people with busy lifestyles. When you are busy with a career, plant care may go on the back burner now and then. Likewise, when you are busy raising children, caring for elderly parents, etc., you may not always get around to watering as much as you should. Then there is your precious vacation time, invaluable for relieving stress. If you leave your landscaping unattended for a trip during the summer, you can't always count on rainfall for irrigation. As a result, while you may come home stress-free, you may find that the plants in your yard have experienced quite a bit of stress in your absence. The exception will be with the drought-tolerant shrubs and other tough plants that you grow. Below are some examples. Please read all of the information carefully, since a bush well-suited to one person's situation may not be ideal for another's. 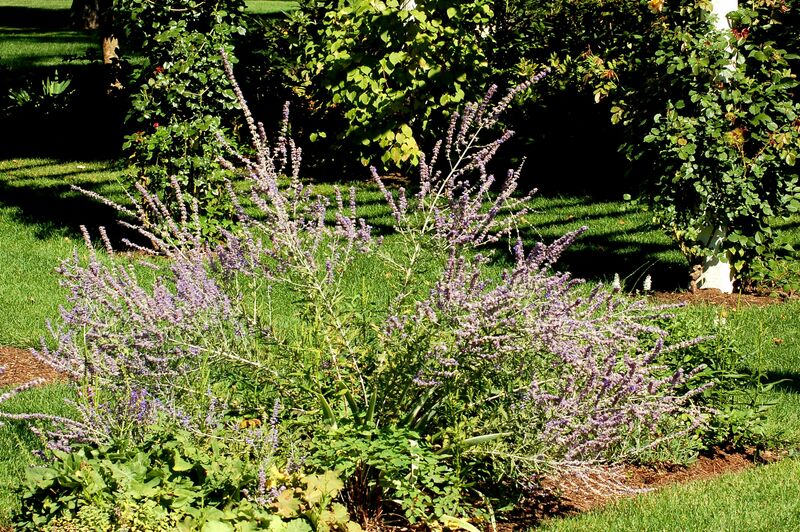 You might not think of Russian sage (Perovskia atriplicifolia) as a shrub. While it is, in fact, technically, a sub-shrub, many folks treat it as they would a perennial flower. Call it what you will, but there is little disagreement that Russian sage's silver stems and leaves give it great potential for use in a variety of striking color combinations. The lavender-colored flowers of this drought-tolerant shrub bloom for a long time. Other good points are that deer don't eat it, and its leaves are fragrant. Monarch butterfly perched on a blue butterfly bush. Some of you, upon seeing butterfly bush listed, will immediately think "invasive." Many invasive plants are, indeed, drought-tolerant, a fact that helps account for their success in surviving and spreading. But, first of all, whether the species plant (Buddleia davidii, in this case) is or is not invasive will depend on where you live (conduct local research before planting). Secondly, plant developers have been working hard to produce cultivars of this shrub that are non-invasive. One such cultivar is 'Blue Chip' butterfly bush. Juniperus squamata 'Blue Star' is more of a useful plant than a drop-dead gorgeous plant. Its blue needles may give you ideas for some nice color combinations. It looks good next to bushes with golden leaves, for example. As a compact bush, it will appeal to those landscaping in small spaces. Here is another feature about Blue Star that you may find useful: Like many other junipers, it is a drought-tolerant shrub. Lantana flower in yellow and pink with a reddish center. Like butterfly bush (see above), Lantana camara can be invasive, but it depends on where you live. In Florida, it grows like a weed. If you live in the North, you will be more familiar with it growing in containers (be it in window boxes, deck pots, hanging baskets, or whiskey barrels). That's because, in areas with cold winters, lantana is too tender to survive winter and is treated as an annual. Red barberries hanging from branch. In the case of the species plant for barberry (Berberis thunbergii), there is no question that it is an invasive plant. The jury is still out on whether some of the cultivars have shaken that "invasive" label. This prickly bush with red berries is truly one of the tough customers of the landscaping world. Not only does it hold up well in dry conditions, but its thorns also keep this deer-resistant shrub from being eaten by Bambi. Once mature, Virginia sweetspire (Itea virginica) is a fairly drought-tolerant shrub. Although this bush is named for the "spire" of white flowers it bears in spring; many gardeners grow it solely for its fall foliage color. As such, consider it as an alternative to burning bush, an invasive plant mentioned below. Leafy branches of Nandina domestica photographed artistically. This plant may be heavenly, but it is certainly not a true bamboo. The latter part of its nickname comes from the resemblance of its stems to those of real bamboo. 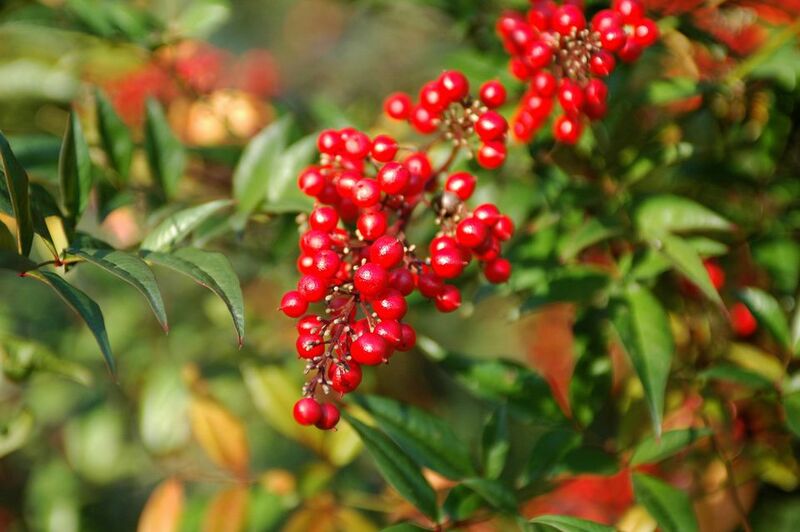 Use the scientific name of the plant, Nandina domestica to avoid confusion. Bamboo or not, it is a popular bush in the American Southeast. Not to be confused with the invasive, red-berried bush mentioned above (barberry), bayberry (Myrica pensylvanica) is a native plant that bears gray berries. Lovers of crafts may know the berries for their traditional use in making candles. Beach lovers may be most familiar with this drought-tolerant shrub as a bush that populates the dunes of the coastal Northeast in the U.S.
Cotoneaster is another bush that produces red berries. As if the berries were not colorful enough in fall, the leaves also turn reddish. One thing to like about Cotoneaster horizontalis is that it can be used as a ground cover, as its species name would indicate. That horizontal growth habit can be promoted through pruning. Just prune out branches that want to grow high. That way, you'll train the bush to stay as low to the ground as possible (if that's what you want). Leaves of burning bush shrub starting to turn fall color. Like barberry, burning bush (Euonymus alata) is a drought-tolerant shrub that is, nonetheless, a problem due to its invasiveness in North America. Reports suggest that the University of Connecticut has developed a seedless variety, however, so help may be on the way. In the meantime, fall-foliage lovers may wish to use Virginia sweetspire (see above) as a substitute. Privet Hedge Before & After. Privet (Ligustrum) enjoys quite the legacy as a hedge plant. Commonly used as such in England, the bush was brought over to America to serve in the same role. Unfortunately, it is invasive in North America, so its popularity is slipping as many homeowners now seek substitutes, such as boxwood (Buxus). Blue mist shrub or "Bluebeard" (Caryopteris) will perform well in many climates even without much watering from you. Sure, it will flower even more if you can remember to provide it with a bit more water. But many will be content to grow it as a low-maintenance bush that you prune a bit in spring. After that, you can pretty much forget about it. But in late summer, when most other bushes have stopped blooming, blue mist does not, fortunately, forget you, reliably putting on that misty floral display for which it is named. It is no surprise that this plant qualifies as a drought-tolerant shrub. Many of you who live in or have traveled to arid regions know bougainvillea well. The image that comes to mind is one of a Mediterranean courtyard, its stucco walls scaled by a lovely bougainvillea (it can be grown as either a vine or a shrub). One occasionally sees it in the North as a container-grown plant, which gives growers the needed flexibility to move this heat-lover out of harm's way when cold gusts sweep through the landscape. Bird of paradise (Caesalpinia pulcherrima) is another drought-tolerant shrub that is more of a desert plant than a specimen suited to colder climes. It is well-known by those who live near the Mojave Desert. The common name notwithstanding, this plant and the "bird of paradise" you may be used to seeing at your local florist shop (Strelitzia reginae) are not birds of a feather: They are two entirely different plants. Like bougainvillea (see above), winter jasmine (Jasminum nudiflorum) can act either as a vine or a shrub. You, as the grower, are the one who controls how this native Chinese plant acts. That is welcome news, is it not, considering how many things are not in the gardener's control? As proof of this plants' drought tolerance, it has naturalized in some of the regions to which it has been transplanted.